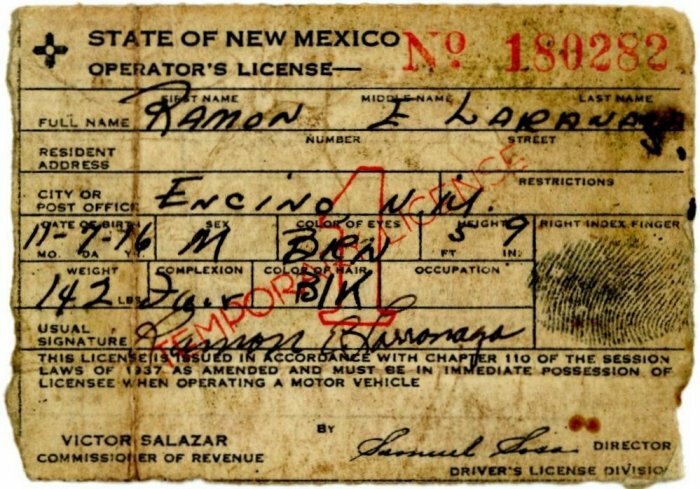 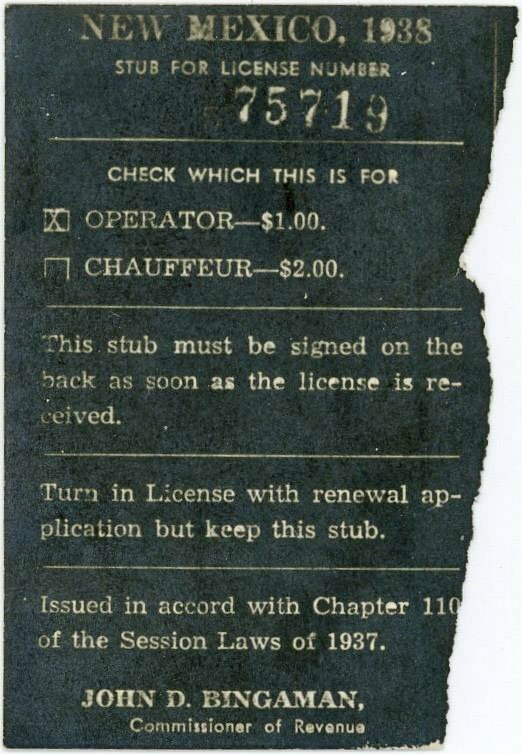 As noted above, New Mexico’s requirement that drivers (operators) be licensed by the state became effective on January 1, 1938. 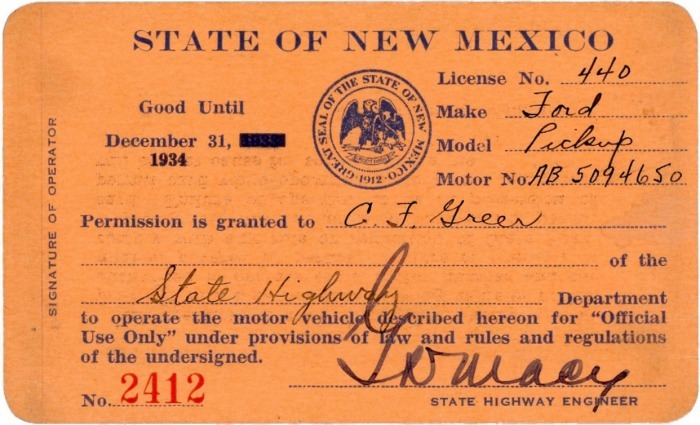 Licenses were issued for the duration of the calendar year, and therefore expired on December 31. 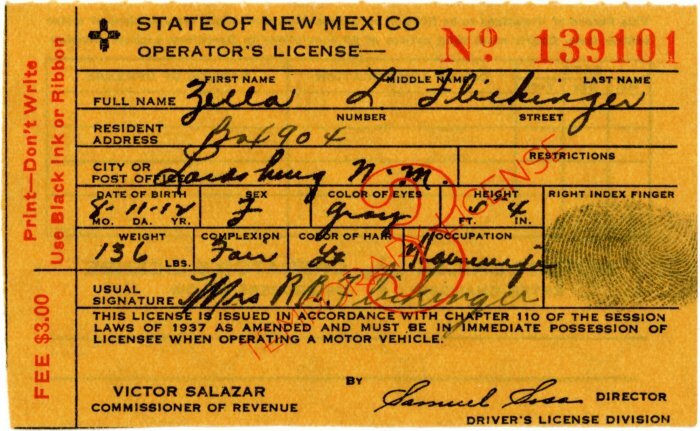 A temporary license could be issued for use for a short time, pending arrival of the permanent license from Santa Fe. 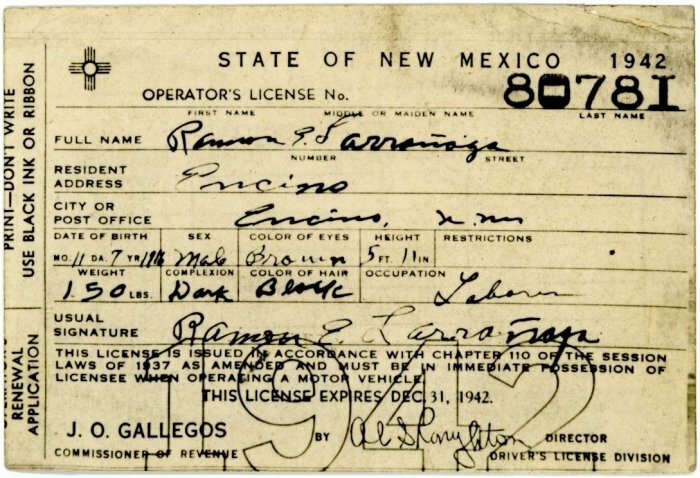 When it came time to renew the permanent license at the end of the year, the stub of the permanent license was torn off and retained by the driver, and the license itself was returned to Santa Fe along with the renewal fee. 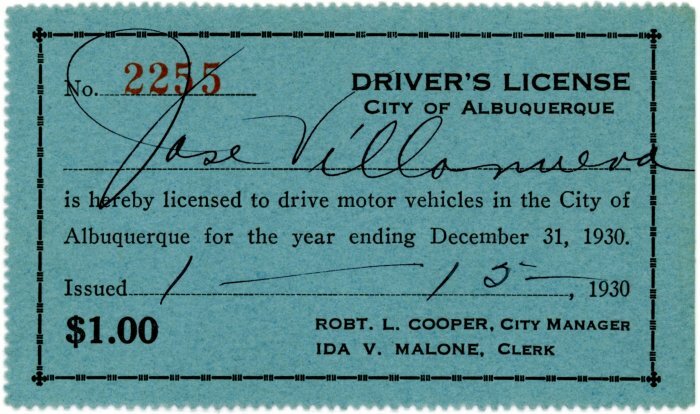 See the 1938 sample license immediately above, and the stub, below, retained by Robert MacDowell, when he renewed his license for the coming 1939 calendar year. 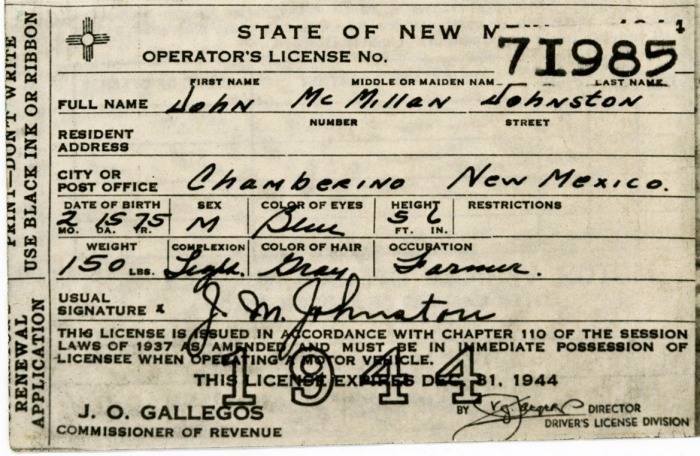 In the next seven photographs it can be seen that MacDowell first received a temporary license on January 25, 1938. 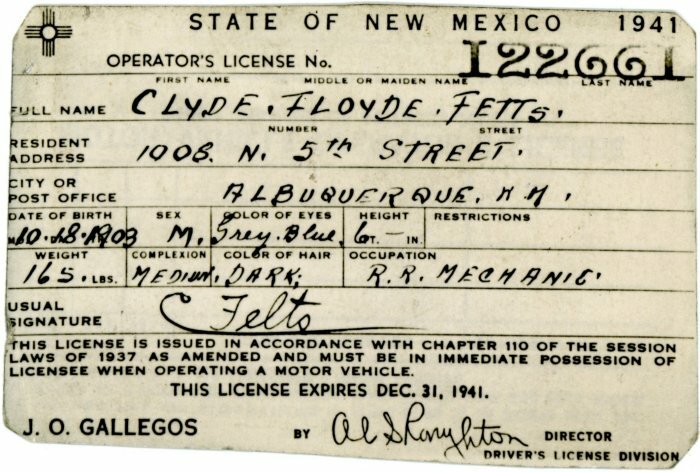 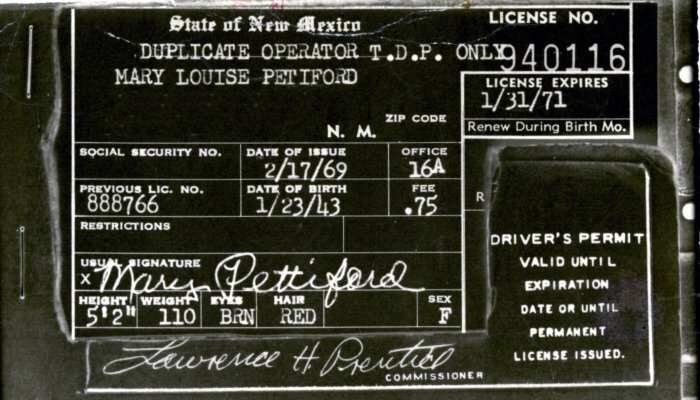 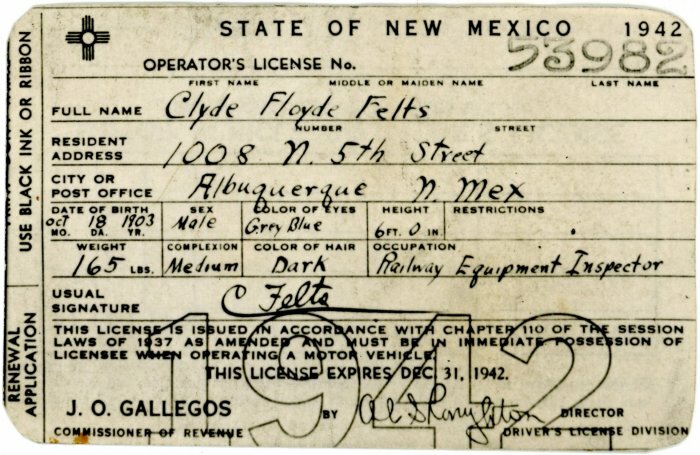 His permanent license would have been received from Santa Fe a few days later, but we don’t know the exact date because all we have is the stub he retained when he renewed the license at the end of 1938. 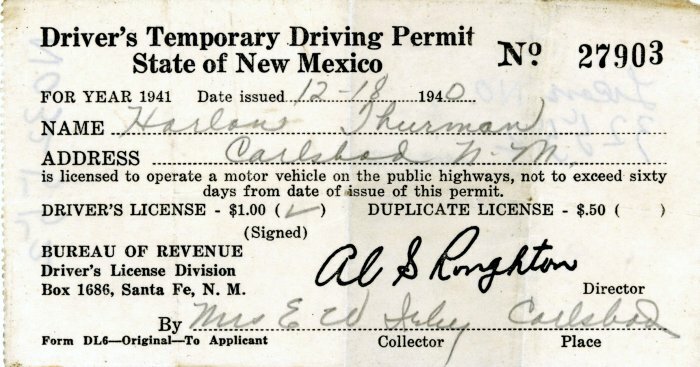 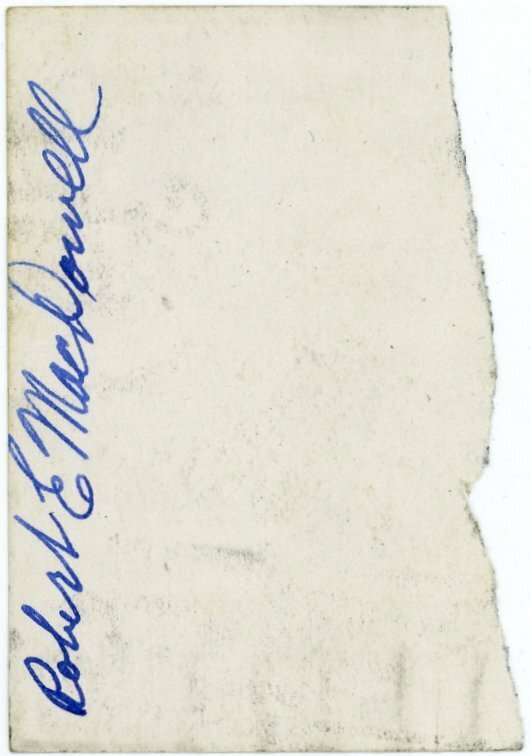 There is also a temporary license issued to MacDowell on December 30, 1938, but the reason for having it is unknown, since the stub of his 1938 permanent license would have served the same purpose. 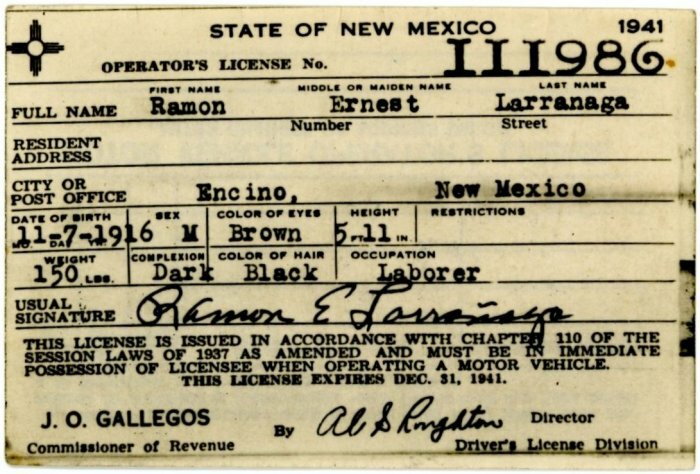 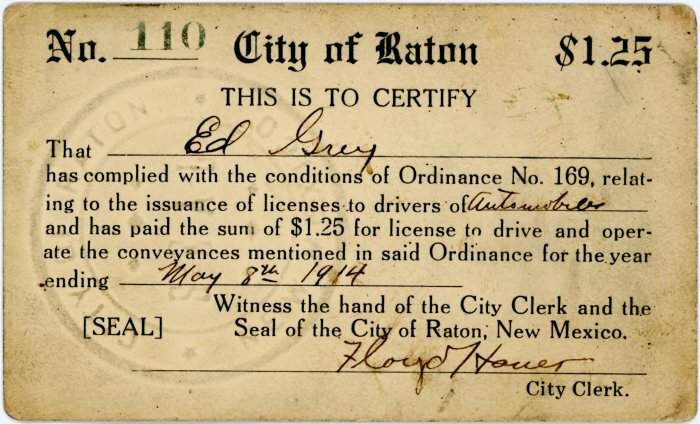 In any case, his permanent 1939 license arrived a few days later, bearing the same effective date as his temporary license, and with an expiration date of December 31, 1939. 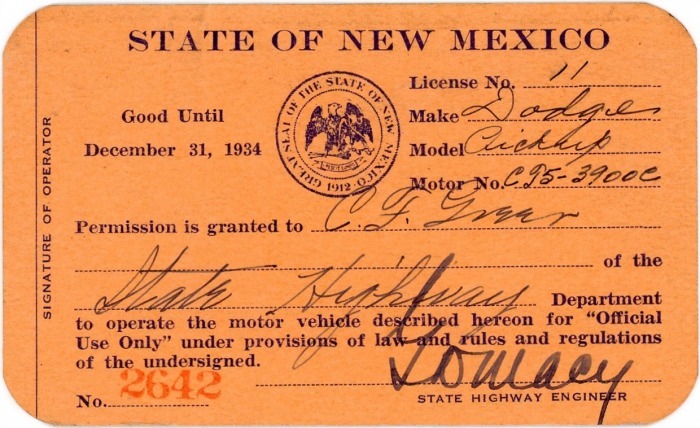 This license, front and back, and the envelope it came in are illustrated in the last three of these seven photographs. 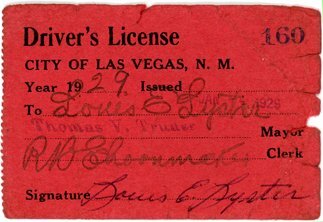 Photo Credits: 1929 Las Vegas courtesy Linda Gegick, Las Vegas Museum. 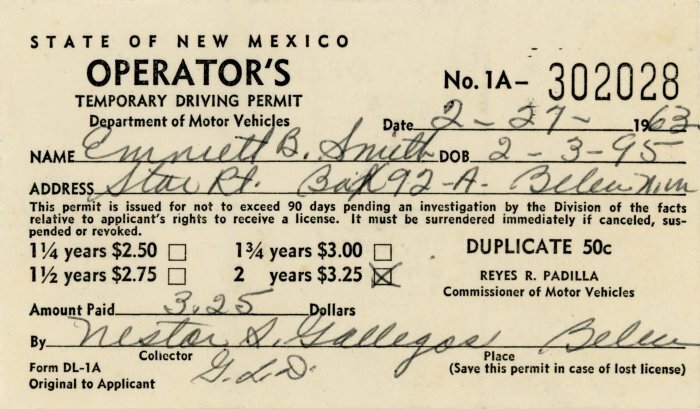 All others by Bill Johnston. 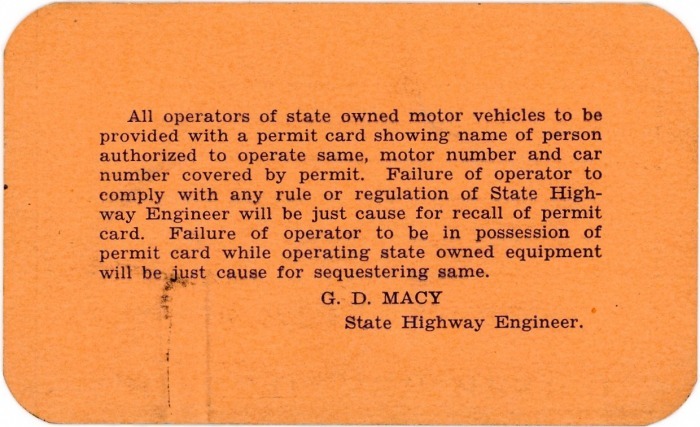 Motor vehicle operator permit cards for state owned vehicles. 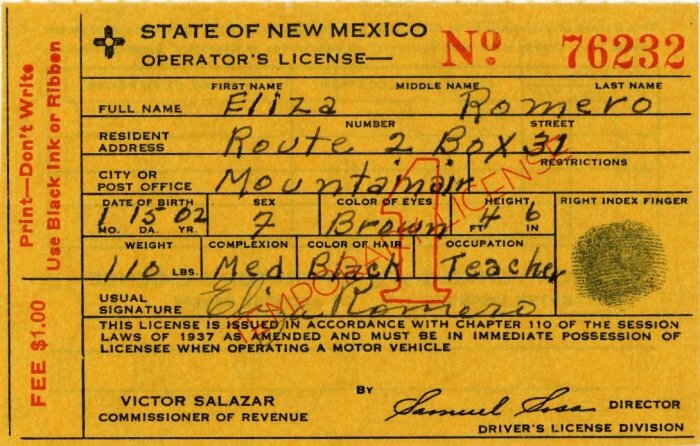 These 2½" x 4⅛" cards are neither driver’s licenses nor motor vehicle registration cards. 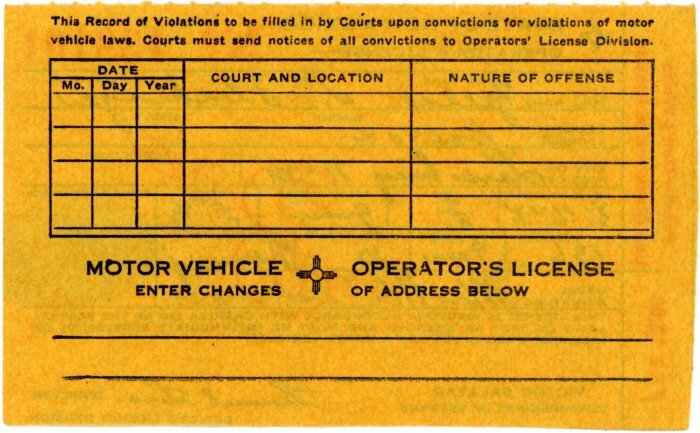 Rather, they are permits which show that the bearer was authorized to use the vehicle identified on the front of the card. 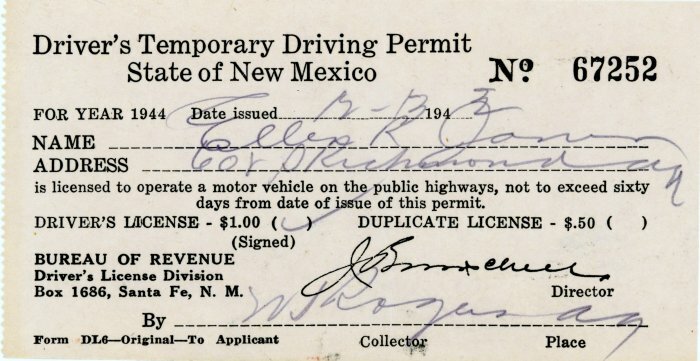 (As explained above, New Mexico did not require driver’s licenses until January 1, 1938.) 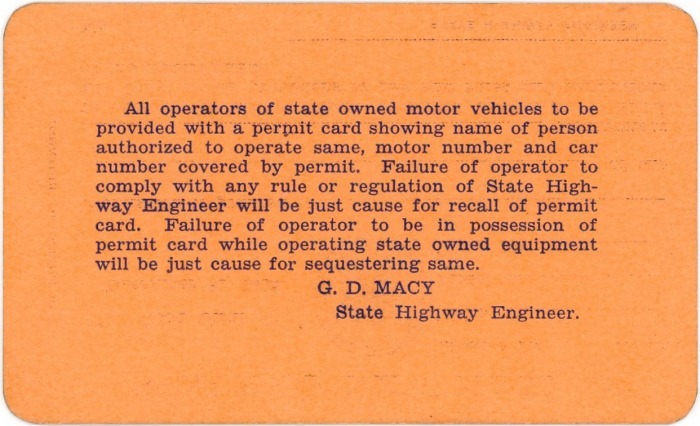 The fact that there is a blank space where a specific department’s name was entered indicates that these cards were likely used for all state owned vehicles in all departments.